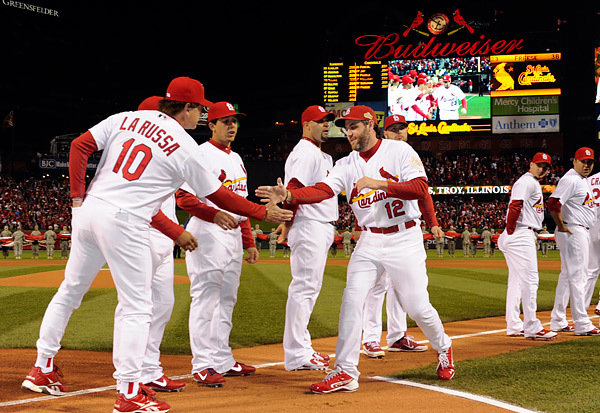 My 2011 World Series assignment working for Major League Baseball Photos kicked off Wednesday afternoon in St. Louis. The MLB Photos photog lineup remains the same as it’s been since 2000 (with the exception of 2005 when I was working for the White Sox), with Director of Photography Rich Pilling leading the way. Brad Mangin and yours truly once again filled out the MLB photographers roster. Between the three of us, we have around 65 years worth of World Series coverage under our belts. Veterans of the Fall Classic are we! This year we are working on a World Series commemorative book, scheduled to be released within 24 hours of the completion of The Series. 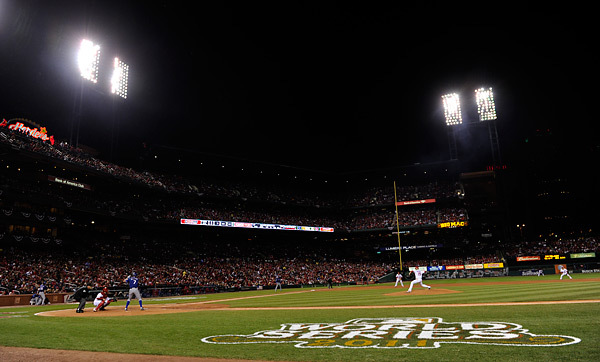 This book project has added both extra excitement and pressure to the already intense atmosphere that covering a World Series carries with it. But it is great to know that many of the photos we end up taking won’t all end up in the “black hole”, never to be seen or used. Mother Nature stepped in and made herself a factor for Game One. 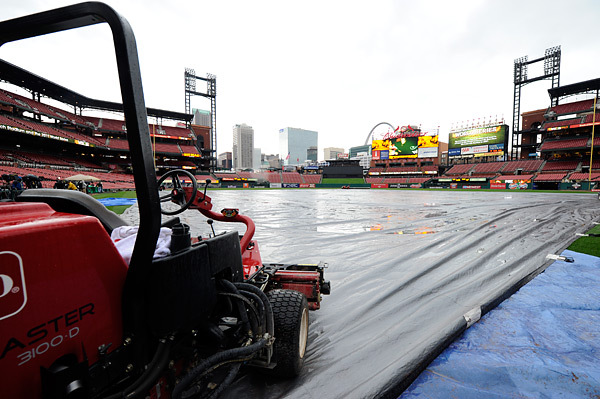 Cloudy, windy, rainy conditions greeted us as we arrived at Busch Stadium four hours prior to first pitch. There went the grandiose plan of making pretty, late afternoon killer light feature pictures! Fans with umbrellas or tarp on the field images were more the order of the day. I was on the lookout for fans carrying “Brock-a-brellas”. Remember those? Lou Brock created a line of baseball cap umbrellas in the 1980’s that were found all over the midwest. Or perhaps umbrella carrying “Rally Squirrels”? Remember, we had a book to think about and pages to fill, one way or another. 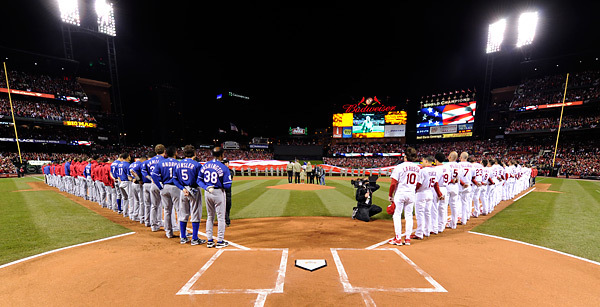 My Game One assignment took on a new feel this year as I became the “field photog” for the pregame ceremonies. Rich, who has been the “Field General” for years was busy covering all things related to First Lady Michelle Obama, so I was handed the responsibility of performing the on-field chores this night. Of course security was extra tight since the First Lady was in the house. Only a pool photographer and myself were allowed on the field for pregame ceremonies. Once the festivities came to a conclusion it was game time, and for me, it’s a moment of relief. The frenzy that is pregame winds down. The start of the game calms me down. Funny, the action relaxes me. Go figure. Many expected a slugfest, but the game ended up much tighter than predicted. 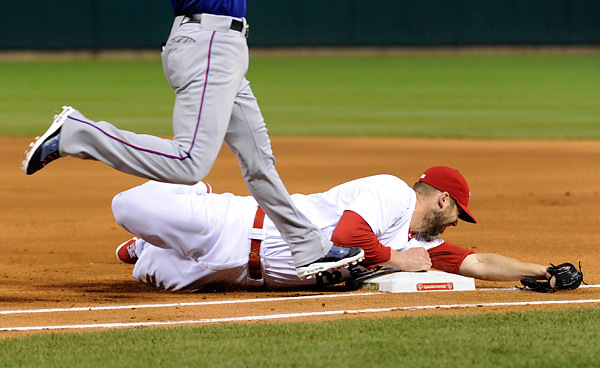 The Cardinals made some nice defensive plays (in particular, Cardinals starting pitcher Chris Carpenter) and made the most out of their opportunities, capitalizing on some timely hitting and clutch pitching to record a 3-2 victory over the Rangers in Game One. 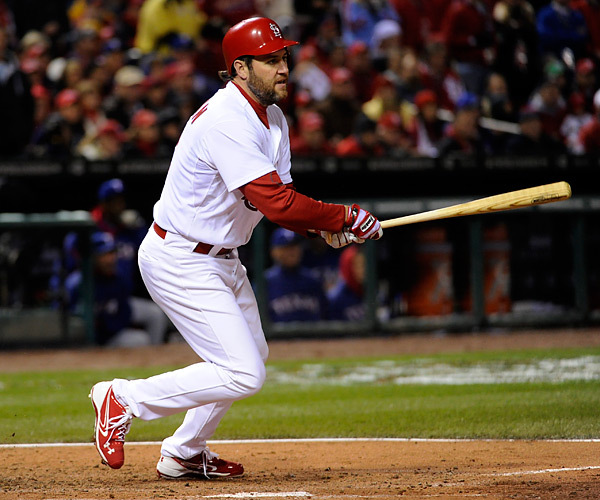 Lance Berkman’s two run single gave the Cardinals a two run lead, but the Rangers Mike Napoli tied the game with a two-run home run in the fifth to knot the game up at two apiece. 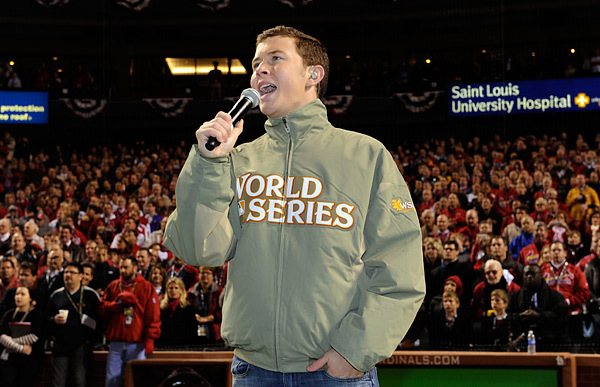 Busch Stadium became noticeably quiet. 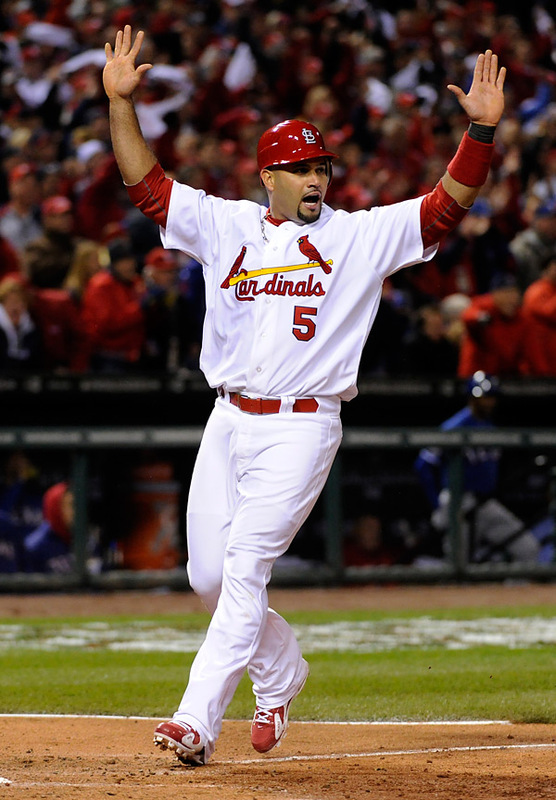 I think Cardinal fans began to worry that perhaps the vaunted Ranger’s offense was waking up. 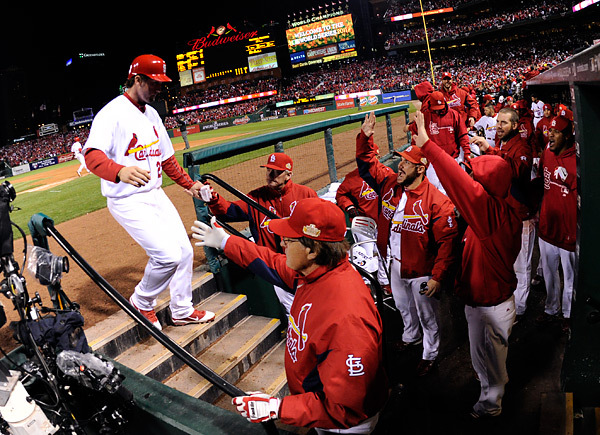 But in the sixth, Cardinals pinch hitter Allen Craig connected for an RBI single to score David Freese in what turned out to be the game winner in the bottom of the sixth. 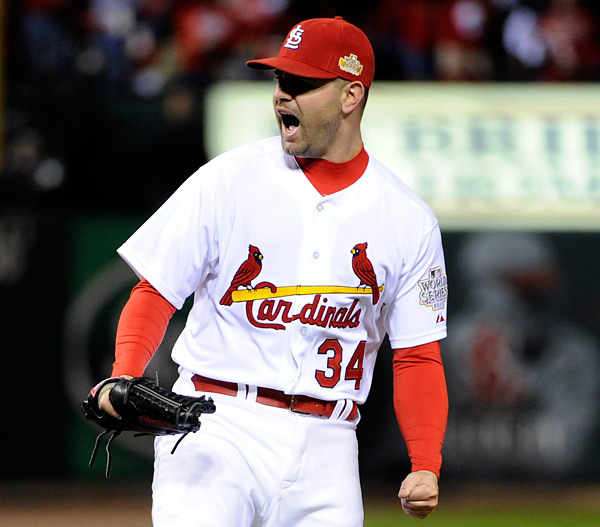 The Cardinals bullpen took it from there, with nice performances by Marc Rzepcynski, Octavio Dotel, the ageless Arthur Rhodes and closer Jason Motte to take Game One. Could this be a replay of the Rangers performance in last years World Series? Game One’s performance seemed to be eerily similar, with their lack of clutch hitting. 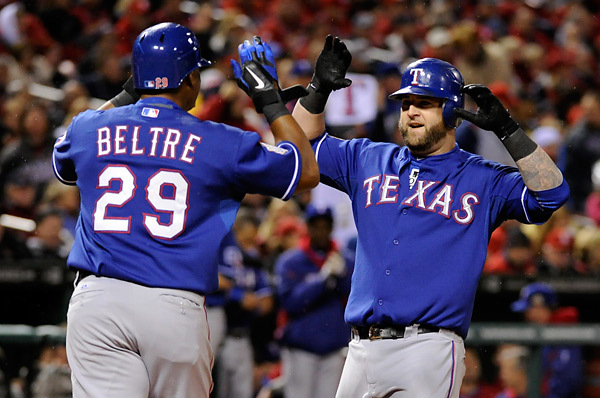 The Rangers had plenty of opportunities and failed to get the job done. I’m thinking tonight’s Game Two is already a must win for the Rangers. This entry was posted on Thursday, October 20th, 2011 at 11:43 AM	and is filed under Assignments. You can follow any responses to this entry through the RSS 2.0 feed. Very nice summary of your Game 1 experience Ron. Thanks for sharing as always. Is it safe to assume you were using the D3s and the 200-400 f/4 for your action shots? I have that equipment too and it really is a great setup. It’s almost hard to believe it works as well as it does for night games (at least under professional stadium lights).